﻿ BunkerBlog » Kleinstglocke 90P9 found! The Channel Islands are still full of surprises. This week a a 6 t. observation cupola was uncovered in Wn Spitzpunkt at Grande Havre. To me it looks like the Kleinstglocke type 90P9 was installed in some sort of small bunker. 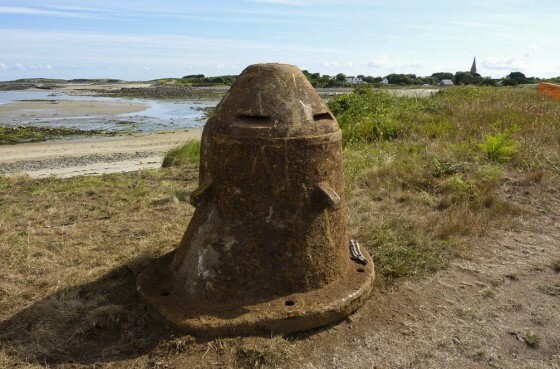 On Alderney and Jersey the same type of turret was installed in Vf bunkers. There are no official accounts of these turrets being used but some where obviously shipped to the Channel Islands. It’s a mystery why the scraphunters left this huge chunk of steel untouched. Steve Powell of Festung Guernsey: “We are fairly certain that there was an anti-tank ditch running along this part of the coast line and a stone throw away there was a depot for the light gauge railway that serviced the islands fortifications. We think this was left in the depot along with some other items and simply tipped into the ditch”.